This chapter has been out a couple of days now but only now I managed to find some time to talk about it. Such a nice title page! His outfit looks exactly how I pictured it. I guess everybody pictured it like that, haha! And Sakura looks so young in the Nakayoshi cover. So young. a) how did he get hold of them? You would think that Sakura herself would notice something like that. b) considering he did get hold of them, somehow. Would he be able to actually use them? Shouldn’t the cards only respond to Sakura because it’s their true master and she is still alive? (unlike Clow that was dead when Sakura could summon them). d) does the teddy bear exchange have anything to do with this? Something like grating Syaoran “permission” to summon the cards? What about the orbs (remember the glowing orbs? ), do they have anything to do with this? e) could this be a whole different set of cards? There are only one answer to these questions but right now is not the time to have it. So the fire card is called BLAZE (I should have known!). It’s such a pretty card. Both AQUA and BLAZE look very majestic. GALE looks so ordinary next to them, even though it’s been confirmed on this chapter that it’s one of the 4 main elements cards. Only the one for earth element missing now. My friend Sakura84-chan pointed out to me what looks like a continuity mistake in the flashback scene of The Fly card. In this chapter, Sakura is wearing her elementary school uniform, but in the original manga, she is wearing her P.E. uniform the first time she sees the card. If you ask me, that’s a strange mistake. CLAMP are very cautious for those details and it would have been a lot easier to cut and paste from the original scene, which makes me think that if this really was a mistake it will probably get fixed in the tankoubon release or there must be a good reason for the uniform change. Update: There is no continuity mistake. It so happens that Sakura was wearing her school uniform the second time (not the first) that she saw The Fly. Mysterious Cloaked Figure makes a comeback appearing after so many chapters. Once again in the real world (not in dreams), watching Sakura. The scene after pratically confirms that the Mysterious Cloaked Figure is or is closely related to Akiho. She cannot be at two places at the same time (or can she?) but it’s getting more and more likely that Akiho is somehow the Mysterious Cloaked Figure’s true identity — a powerful magician and her two guardians: Momo and Yuna. Sakura looks SO pretty with Yukito’s hairpin. That hairstyle looks adorable. I was indeed wondering when we would see her using it and it looks great. Lots of important things happened on this chapter. It looks like things are starting to move at a decent pace again. Volumes 5 and 6 are going to be filled with interesting events and twists, I’m sure of it. Yay 26 pages for this chapter! At least we got ourselves a bit more pages than we’ve been getting for the last few months. 145 pages for volume 4 and that’s pretty much a wrap for volume 4! By the way, volume 4 has been announced for a March release. Next chapter will be out at the beginning of February! His battle costume is indeed very much what everyone had in mind XD Hard to imagine any other colors than the ones CLAMP used! I still would have liked to see a Sakura x Syaoran battle costumes illustration, but this is just me nitpicking, it looks awesome and I am happy! The battle itself ended really fast and again, no follow up, it’s just about Sakura returning home like usual, this seem to be the trend in this Arc: short fights and, that’s it ^^; I haven’t re-read the old volumes for a while now, but were the captures always so quick? I think they weren’t, and maybe CLAMP is trying to pass a message here: Sakura is more powerful, she is not that confused 9 years old unexpectedly facing a World of Magic she never knew about until she opened the Clow Card Book: she now can deal with many things all on her own, and get it done well and fast. I was personally mostly in the “these must be the Sakura Cards” team, considering how torn and guilty he’s been since he returned from HK, but with reserves, because of the reasons you mostly already wrote about: the only moment, it seems, in which the Sakura Cards might have potentially been “stolen” would have been when they turned transparent, when she encountered the MCF, but said MCF is revealing itself to very likely be Akiho or someone close to her, not Syaoran, as seen once again in this chapter. UNLESS Akiho is only looking through someone else’s eyes, just like TRC|Syaoran looked through Clone|Syaoran eyes? So yes: when and how is he supposed to have taken the Sakura Cards powers? The magic-less clear vessels of the cards are all still inside the Sakura Card Book, so does it mean new vessels that can contain them (in the shape of cards too) were created just for this moment? Another point I found important which you didn’t mention is that for the very first time, Sakura seems to have caught on, even if just for a moment, that something was amiss about Syaoran. Since his return, and with everything happening, she’s been divided between a rose colored world being/thinking about the one she loves the most, and fighting/securing cards. But there was a bit of awareness that Syaoran wasn’t acting normally here, and I’d like to see if CLAMP will pursue this or not. I never forgot about the fact Fujitaka couldn’t see her anymore, but I thought that the parents plot would be one thing, and Sakura and her clear cards another, and maybe both events would meet at some point; but now, it seems like Sakura is directly involved with it. I am curious to see where this is going, but on the very last panel we could see Nadeshiko already beginning to dissolve, so I’m not sure we will get a direct continuation of their encounter in the next chapter or not. I hope we are going to back to the 30-something page count too! I haven’t re-read the old volumes for a while now, but were the captures always so quick? I think they weren’t, and maybe CLAMP is trying to pass a message here: Sakura is more powerful, she is not that confused 9 years old unexpectedly facing a World of Magic she never knew about until she opened the Clow Card Book: she now can deal with many things all on her own, and get it done well and fast. Yes. I think there is a bit of that and also that the cards are not as dangerous as they appear to be. And if as you said they might not be attached to their master Sakura after being ‘cleared’ and are now under Syaoran as a master, isn’t all this way too simple? If that’s really the case and it’s indeed Sakura’s card he is using, then I think the teddy bears have something to do with this. I also noticed that. I guess the only thing that Sakura will think about is how concerned she looked. Yay for spread next issue to open volume 5! I hope for at least 28 pages. C’mon. ahhhh! i wish this capture was harder and more action. 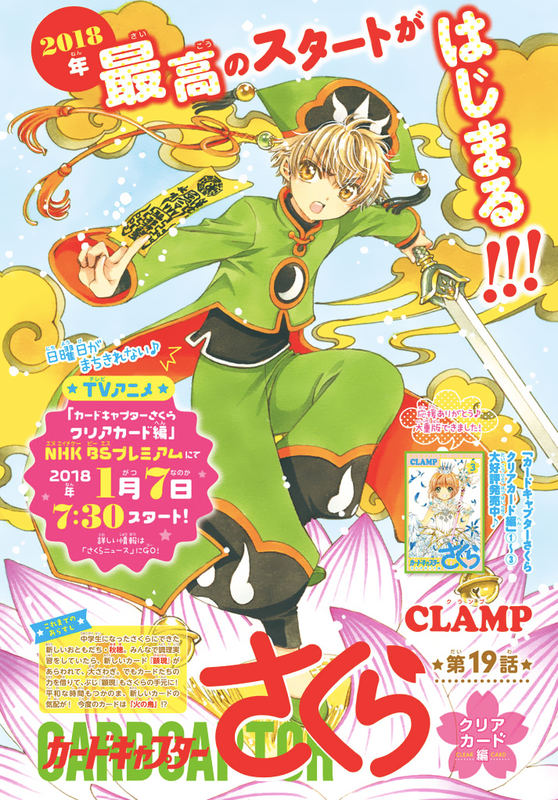 it was too quick again… but we got syaoran development as i thought. that card he pulled out… i do think he has the sakura cards. easiest answer as to why he looks so sad using it and why he looks guilty most of the time. maybe eriol and syaoran did something before the sakura cards fell into the wrong hands. as to why sakura doesn’t notice- well isn’t this the theme in this arc? she seems somewhat immune/unable (?) to sense moon based magic. so if those are the sakura cards i imagine they lost their power base since they got erased at the beginning. so say syaoran and eriol got hold of them are they now moon based? that would complete their cycle. they were sun based under clow… star based under sakura… and now moon based under syaoran if only temporary? another theory is are these cards that syaoran and eriol created together… or something clow left for syaoran to use when the time came. onto the final scene. love that hairstyle sakura!! ❤ and she can finally see her mum!!! but fujitaka is right there and didn't sense or see anything?! but again sakura doesn't talk to her dad about it. she knows he has powers now since she gave them to him herself…. but still she wont say anything and still hides things. nadeshiko dissolving doesn't look too good though… or is that just how it looks with her fading away back to heaven? I think the cards are easy to capture because they might not be as harmful as they appear to be. A shame they didn’t draw the both together, or even just match the cover with the title page. As for Xiaolang’s attack, it looks like a wind card… maybe. Interesting that we see him use this card just the week before the anime’s first episode, I wonder if we will see the shape of a card when he’ll fight SPIRAL in the anime. As for the nature of the card, I definitely don’t think it’s a Sakura card, as they are sealed. It would be much more probable that he either received a trump card made by Eriol himself, knowing what was to come, or that Eriol taught him how to make one. If the later is true, it could explain why Xiaolang isn’t wearing his family’s colors anymore, he is a card user now, or even a card creator. I don’t think he has an entire set though, one or maybe just a trump cards. As for his guilty face, he would feel guilty of keeping the secret and going as far as to use it just a few meter from her, yet not letting her know anything. Just hoping she will understand in the end. Now the big question is, did Tomoyo caught his card with her camera? The cloaked one is showing up after the fight. And Akiho has made the same dream as Sakura, where they fight together for the key. She’s definitely liked to the cloaked one, the book and the cards. She mention this final fight is how the book is ending, and although she doesn’t explicitly name Alice in Clockland, she has her hand on a book as she said it, which is probably this one. As for Nadeshiko’s ghost, is it really her? She has the same cloth and hairdo than on the picture. Could it be the Clear Card version of ILLUSION? Or maybe a card interfere and make Fujitaka unable to she her, hence why his comment earlier in the series. We’ll see with next chapter if he see her too (as he would with a Clear Card). … just a few trumps cards. I miss their matching, sister illustrations. They haven’t been doing that much lately. It would be much more probable that he either received a trump card made by Eriol himself, knowing what was to come, or that Eriol taught him how to make one. If the later is true, it could explain why Xiaolang isn’t wearing his family’s colors anymore, he is a card user now, or even a card creator. I don’t think he has an entire set though, one or maybe just a trump cards. Where did she mention that? I guess I missed that one. Could it be the Clear Card version of ILLUSION? But I could swear that The Illusion’s counterpart was LUCID. I could be closer to ERASE or it could really be Nadeshiko. Hummm the English translations say: “This dream advances just like (a) book (does).” so it’s a little unclear if she’s talking about the ending. My brain automatically conclude it’s the end Alice in Cloakland she is seeing in dreams. Although, we’ll have to wait and see. I just noticed that Sakura doesn’t write her name on the Clear cards. Clow didn’t write his name on Clow cards either since he is their creator. This may be a hint that Clear cards are actually created by Sakura. That’s very well observed. I remember this in the beginning of the manga serialization, but it’s been so long that I haven’t paid attention to that fact recently, but it is something that is worth paying attention to. Hello 🙂 I’ve recently discovered that CCS is back, and I’ve been sooo happy! While trying to catch up, I read this post and the previous ones (all of them are very interesting and insightful!). One of the things that caught my eye was Syaoran’s new technique, which immediately reminded me of TRCTsubasa’s technique (at least in the Tokyo Revelations OVA). Somebody mentioned that he might have met the clones back in Hong Kong, and learnt it. That got me thinking. Putting aside the question of whether at all the clones were reborn in CCS dimention or not (personal opinion – not, another thing is that Yuuko mentioned wanting to meet S&S from her world, so if anything then it Watanuki might be living somewhere in CCS’s future), It’s somehow hard for me to believe that CLAMP would be introducing characters from the TRC plotline. Why? It was mentioned before that the CCS world is VERY warm, kind and supporting (and full of lovely floating sweets) while TRC has a much darker tone (I don’t recall ever seeing blood in CCS even from a papercut). Another thing is, that while TRC was from the beginning a multiuniverse manga, CCS wasn’t, so I somehow don’t think that CLAMP will make the readers scan through the 200+ chapters of TRC and XXXholic to look for reference. My opinion is that it’s some family magic (the sword summoning, no idea about the card) which was also taught to Clone Syaoran after he was reborn, as some sort of a parallel between the people in different dimentions and their abilities.